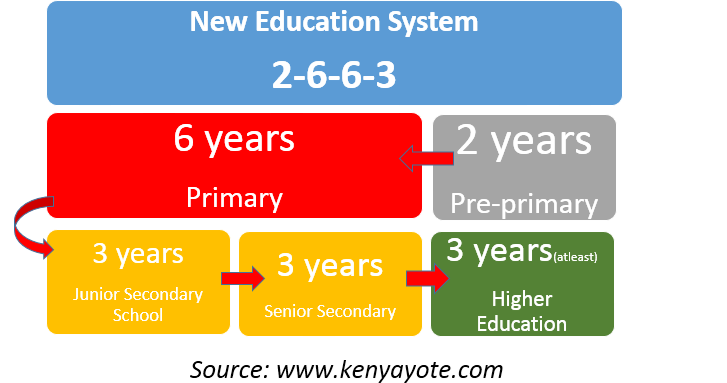 The 8-4-4 system of education which started in 1985 is coming to an end to pave away for Kenya’s new 2-6-6-3 education curriculum framework. Reports indicate that new education curriculum will be tested starting May 2017 in a few selected schools by the ministry of education led by CS Fred Matiangi and KICD. 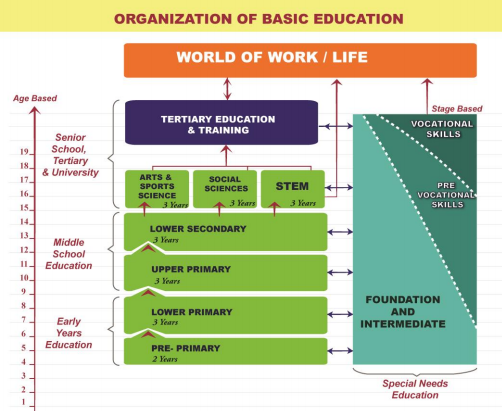 The basic education curriculum framework vision and mission are supported by three important pillars; values, theoretical approaches and guiding principles. Education and Senior School. Image below presents a summary of the structural model. All learners are expected to begin their education at this level. It is a two year programme. NB: Digital literacy and pertinent and contemporary issues will be integrated across all Subjects. The learners from pre-primary 2 will join lower primary in grade 1 at about 6 years of age and spend 3 years in this part of Early Years Education before exiting to middle school at the end of grade 3. NB: ICT will be a learning tool in all areas. Pertinent and contemporary issues will be mainstreamed in all Subjects. This shall comprise three years of upper primary and three years of lower secondary education. Upper primary is part of middle school. It is a three year programme where learners are exposed to a broad curriculum and given an opportunity for exploration and experimentation. ICT will be cross cutting in all subjects. Pertinent and contemporary issues and life skills will be mainstreamed in all Subjects. A pastoral program of instruction will be conducted once a week. and senior school (Grades 10, 11 and 12). Graduates of primary school Grade 6 shall join lower secondary at Grade 7. Lower secondary will expose the learner to a broad based curriculum to enable them to explore their own abilities,personality and potential as a basis for choosing subjects according to career paths of interest at the senior school. At Grade 4 learners will be introduced to the optional subjects offered at upper primary so as to make informed choices at Grade 7. Learners in lower secondary will undergo a rigorous career guidance programme and be exposed to the related subjects to enable them to make informed choices as they transit to senior school. The Subjects are in two categories; core and optional subjects. At this level, a broad based curriculum is offered to enable the learner to explore their own interests and potential as a basis for choosing subjects according to career paths of interest at senior level. Learners will be required to take the 12 core subjects provided. NB: ICT will be a delivery tool for all Subjects. Learners are provided with an opportunity to choose a minimum of one and a maximum of two subjects according to personality, abilities, interests and career choices from the list provided. Senior School comprises three years of education targeted at learners in the age bracket of 15 to 17 years and lays the foundation for further education and training at the tertiary level and the world of work. It marks the end of Basic Education as defined in the Education Act, 2013. Learners exiting this level are expected to be “empowered, engaged and ethical citizens” ready to participate in the socio-economic development of the nation. The learner entering this level shall have had opportunities at lower secondary to explore their own potential, interests and personality and is therefore ready to begin specialisation in a career path of choice. The specialisation entails choosing to pursue studies in one of the three pathways available in senior school. He or she can choose the Arts and Sports Science, Social Sciences or Science Technical Engineering and Mathematics (STEM) pathway. Schools will be specialised institutions that will provide opportunities for learners to focus in a field of their choice as well as form a foundation for further education and training and gaining employable skills. Senior schools will be required to therefore organise open days to enable learners and parents to glean the information necessary for effective decision- making. Additionally, a robust parental empowerment and engagement programme will be necessary to strengthen the involvement of parents in this process. Learners with special educational needs, like any other learner, have potential that needs to be nurtured. 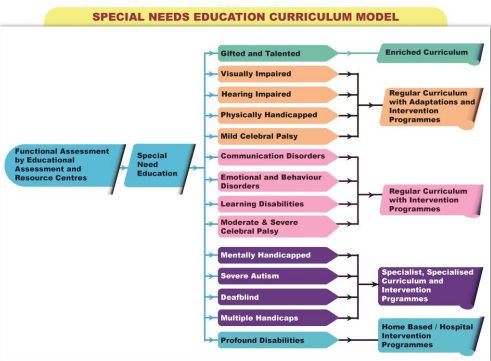 The special needs education curriculum model illustrated below indicates curriculum provision for learners with special needs. We hope you have got a basic understanding of the 2-6-6-3 curriculum. We will continue sharing information about Kenya’s new curriculum system. You can also drop us an email for any inquiry. Schools that have been shortlisted for the new education system pilot study: Download pdf. Do not miss our latest updates on curriculum reports in Kenya and the transition stages upto college/university. Has the new system focused on children’s right and other factors such as cognitive development and behavioral theory? I don’t think there is any focus at all on Children’s right. The new curriculum is a brain child of Dr. Koech (1999) which was never recognized but instead rubbished by the then president Moi terming the whole report as mere wishful thinking and unworkable and instead scrapped the then famous home science, music, art and craft and agriculture which are now reintroduced though labeled differently. Now you see, the problem in Kenya is failure to implement needed changes on time as recommended by its great theorist. thanks to the new curriculum I hope it would transform our nation KENYA to the wanted direction.